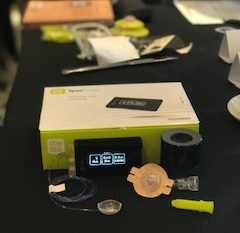 Diabetes educator’s love nothing more than an opportunity to get their hands on the latest diabetes technology… so it was off to Sydney last Thursday to play with the new YpsoPump that Ypsomed were launching in Australia. Ypsomed is a Swiss Company, best known in Australia for their My Life Click Fine needles and needle remover. Declaration … I love these products. The ‘click-in’ needle makes it easier for people on insulin with a physical or intellectual disability or dexterity issue, so I was really excited to see what their new pump had to offer. Fun Fact: Needle remover is no longer being produced. The Australian Ypsomed (pronounced ‘ipsomed’) team were joined by some ‘big gun’ Execs who flew in from Switzerland for the Australian launch events. The assembled bloggers, including a number of the veterans and stars of diabetes social media, made my first official Blogger Event (does that make me a ‘real’ blogger?!) a blast. Check out their reaction to the pump via the links at the the end of the blog. Declaration … Ypsomed covered all of the costs involved in attending this event (flights, accommodation, taxi, meals). I wasn’t paid to attend and was not expected to write anything to attend. These words are my own and uncensored … imagine someone trying to censor me?! Thanks Ypsomed for including a blogging CDE in the event! It was ‘fingers at the ready’ as the Australian diabetes twitter networks lit up with tweets, photos, likes and shares as the event began. Information zipped its way around Australia as we did ‘our thing’ sharing information and thoughts on the pump! First impressions? This Swiss made pump (does that make it the ‘Rolex’ of insulin pumps?) is small (L46mm x H78mm x D16mm), light-weight (84g with battery and insulin filled cartridge), easy to use with its intuitive processes and waterproof. The size, weight, colour (black) and shape make it discrete and easy to fit into a pocket, bra or nifty pump storage solution. Fun Fact: The pump is lighter than the detailed but clear Quick Start Guide/Instruction book! The YpsoPump won a Red Dot design award in 2016 – not surprising considering Ypsomed is focussed on making ‘medical self-treatment a matter of routine for people with diabetes’. Its simplicity includes a single function button and touch screen with minimal information on the screen to focus the user on customising their insulin delivery without distraction. Many of the icons are logical and the rest you would get used to pretty quickly. The use of the screen draws on the actions used with many mobile phones (e.g. swipe left or right to move through the icon menu, icons for starting and stopping music to start and stop the pump, move through the dial wheel for date and time). An alkaline AAA battery slips into the battery compartment and is screwed in place to keep it waterproof (lasts approximately 1 month). The My Life YpsoPump reservoir is self-filled with 1.6mls of the rapid acting insulin of choice. Infusion sets come in two needle lengths (6 and 9mm), flexible teflon or steel cannulas, and 4 tubing lengths (45cm, 60cm, 80cm and 110cm). I really like the connector rotation that allows 360 degree mobility – great for active kids and adults alike. The Orbit inserter appears simple to use and is re-usable, decreasing the waste the disposable inserters create. The screen display can flip to suit left and right handed function button use. But wait … there’s more! The pump links with an app on your smart phone to do the insulin to carbohydrate ratios – one of the reasons the pump is easier to use. It then sends insulin related data via Blootooth from the pump to the app when synced. The packaging is attractive with detailed instructions and a Quick Start Guide included. I would have preferred a larger sized font for improved readability given many people with diabetes experience blurred eyes when glucose levels are high or from the impact of other eye conditions. The pump appears to be easy to teach and would be helped by an enlarged version of the ‘Menu map’ in the Quick Start Guide. It would make a valuable teaching resource for CDE/DEs to use and handout for people getting started with the pump. Declaration … I don’t do pump starts… well, other than the occasional pump replacement for people I see – and the Company representative does the session with me. That doesn’t mean I don’t need to keep up-to-date with the range of pumps, their evolving technology and how to use them. I do. I see a number of people with type 1 diabetes using pumps, and also need to be able to advise people using multiple daily injections on the benefits a pump could bring to their management so they can make informed decisions about their insulin delivery. People on pumps also see GPs, Practice Nurses, medical and surgical specialists, they see anaesthetists, go to hospital and are seen in Accident and Emergency. Therefore doctors and nurses also need to keep abreast of the technology to work with the person with diabetes to manage their insulin therapy during the various contacts a person has with health professionals. If Ypsomed’s customer service (will be based in Australia) around the pump is anything like the assistance I recently received it’s likely to be outstanding. I wanted to order some of their needle removers and explained they were required to help prevent disability support staff from getting a needle stick injury. Before the week was out, a box arrived from Switzerland with the last few remaining devices inside! I’ve arranged for a colleague with type 1 diabetes to put the YpsoPump through its paces so look out for another blog on the pump from me in the near future! It’s always great to catch up with my fellow tweeters and bloggers! 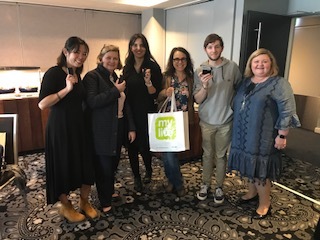 The photo to the left shows some of the bloggers at the YpsoPump Blogger Event in Sydney last Thursday and a hyperlink on their Twitter handle to their blog on the YpsoPump! Their insights are fantastic and a must read for any CDE/Diabetes educator involved or interested in pump starts or discussions with people with diabetes about the options. (L to R): Ashley (@hangrypancreas), Melinda (MelindaSeedT1D), Renza (@RenzaS), Rachel (@Yogafordiabetes). Frank (@FrankSita), Jayne – ME! (@JayneEdHealth). Absent from the photo: David (@BionicWookie) and Helen (@yourdiabeteshub). Read more about YpsoPump here.